Sometime last year I concluded that my 50th birthday in March of this year would be a milestone worthy of finally knocking off a 100km event. In fact, I thought to myself, why leave it at one and waste all that training? Why not two? 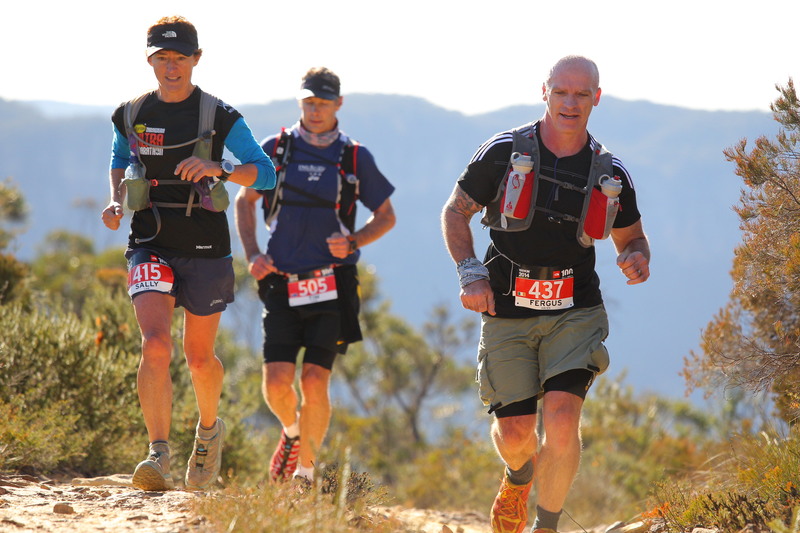 Hence my plan to tackle the Vibram Tarawera 100 in NZ on 15th March and follow it up with TNF100 in Australia on 17th May. Not only did my plan have a nice symmetry to it, conveniently book-ending my birthday on March 21st, but the Tarawera event, at around 2800m of elevation, would be an excellent springboard to the TNF100 with its daunting 4500m of climbing. I was already very familiar with the Tarawera Ultra terrain having run its 60km and 85km distances in the preceding 2 years. 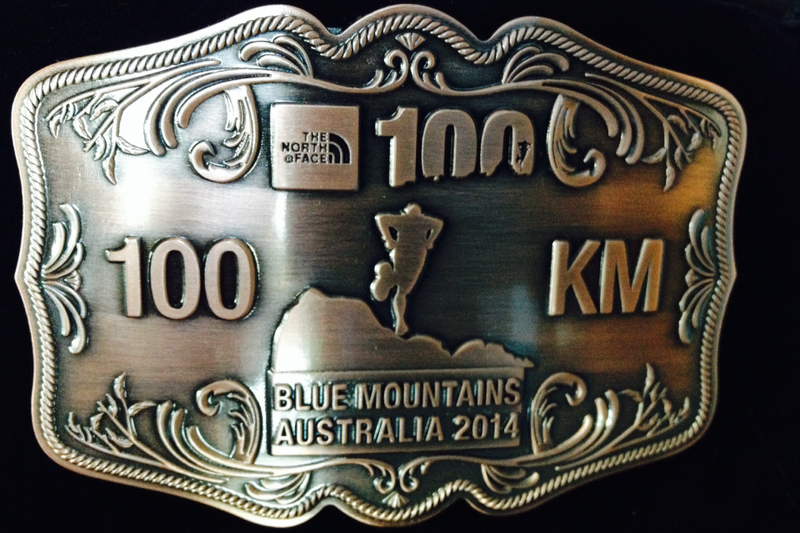 I had unfinished business with the 100km though and was totally focused on smashing it this year. Unfortunately, at the same time that race goers were heading toward Rotorua for the Tarawera ultra a cyclone was bearing down on precisely the same location forcing race organisers to make last minute changes for safety reasons. Their announcement came the night before the event: the 100K course was to be shortened to 74km. I had wanted that 100km so badly I actually cried (sad, I know!). 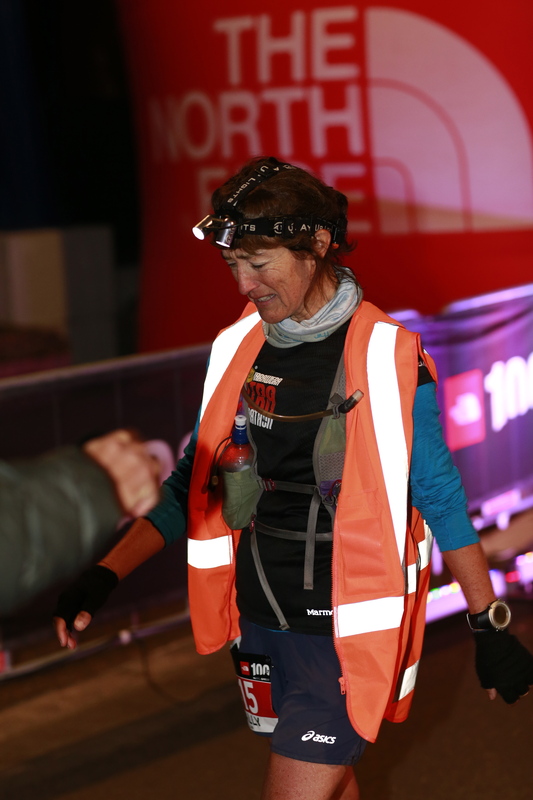 This turn of events however directed the spotlight onto the TNF100 as the next opportunity to get my hands on the illusive 100km prize that was growing alarmingly in its importance. There was a lot of hype surrounding the TNF, especially this year with all the discussion around the course change and how much more demanding this already difficult race was going to be. I felt somewhat intimidated by this but excited at the same time because my training was going according to plan and I felt strong. Having moved from Auckland to Wanaka in January I had access to hills and mountains right on my doorstep. I couldn’t have asked for a more suitable, or more spectacular, training ground. Then on April 4th, completely out of the blue, everything changed. My husband Mal and I were sitting in a restaurant with my parents. We’d had a bit of food and had just got our drinks when I passed out. Suddenly I was at the centre of a medical emergency as someone called an ambulance and a passing doctor rushed over to help. He couldn’t find a pulse so went straight into CPR (not something you want your husband or parents to witness). Coming to, and unable to control my limbs or face, I was certain I was suffering some kind of catastrophic brain implosion. My life as I knew it was over, I’d be a low functioning invalid unable to communicate. I felt unadulterated terror crushing down on top of me. The next few bewildering hours were followed by 4 surreal nights in hospital as myriad tests were undertaken to discover what had gone so wrong. They had me hooked up to a heart monitor, I was told I wouldn’t be allowed to drive for up to 12 months and that for the foreseeable future I wouldn’t be able to run alone or without a personal locator beacon. It was scary stuff. Mercifully the neurology and cardiology results were all favourable although a benign ectopic heart condition is still being investigated. Two major contributing factors were found to be dehydration and low electrolytes. Unbeknownst to me, the move from Auckland’s humid, moisture-laden air to the extremely dry, mountainous air of Wanaka three months earlier with no corresponding change in my hydration habits meant I’d been slowly drying out like a dis-used sponge. I’d tipped over an invisible edge. It was a shock but now that I knew – there was no way in hell it was going to happen again. What’s more, the specialists all said they could see no reason why I shouldn’t keep training for that 100km. Although this was fantastic news my head was pretty messed up. Robbed of my confidence I felt vulnerable and was constantly worrying about ‘what ifs’…what if they’d got it wrong? What if it did happen again? And what if I was by myself?? Wanaka is a small town in the mountains where the trails are fairly remote. At first I ran with company, then after a couple of weeks I braved it alone again but always, always with my phone. Eventually, despite that week of no running at all, I found myself back on track for the TNF. The good news continued: two weeks out from the event I was given the all clear to drive again. Group 4 pre-start music: Highway to Hell blaring! First 4km was out and back (initially up the road away from the direction of the course proper). Hard. Legs felt sluggish, no bounce and my backpack felt so heavy with all my gear and 2L of water. Made a conscious effort to stay calm, run my pace but not worry if I got slowed in traffic. Heck we were only on leg 1 (10.5km) and I figured there were going to be plenty of opportunities to run my pace. Why bust a gut early – that would be dumb. Just settle, go with the flow. Golden Stairs – horrible!! They were STEEP and tall steps – big ups for a shorty like me. Had to stop a couple of times and heaps of folk passed me. I felt quite light headed, panicked slightly, clung to the railing and tried to breathe. A relief to get to the top. CP1 appeared. I grabbed a banana and filled my bottle, tossing in a Fizz tablet. It was heating up. I was beginning to feel uncomfortably warm in my long-sleeved polyprop and tee. There must have been a queue at the Tarros Ladders. I was with a group that got diverted from near the top (I didn’t even see the ladders) and had to go down the longer, 400m scramble to meet up with the others somewhere further down. It was definitely slower as I saw someone just ahead who I’d passed not long before the ladder section. Someone in the group with me quipped that we ought to be compensated for this extra distance by being allowed to use the railway up to Scenic World instead of the Furber steps at the 99km mark! CP2 I filled bladder and bottle. Took off my polyprop and felt instantly better. Grabbed half a banana and a bit of watermelon. There was a tall metal stile not far out of CP2 where I saw a couple of guys ahead of me stop to do a bit of a stretch, throwing one leg after the other up to a high step. Good idea I thought, so I did the same but all it did was instigate a nasty bit of cramp in my left inside leg that would bother me badly on and off for the next few hours. Idiot! I thought to myself. Got up and over the steep Ironpot ridge ok (nice bit of single track along the top – with some aboriginal music as backdrop. Awesome. Stunning views too.) It was a steep descent on very dry, fine gravelly dirt – slip sliding downwards. Landed on my arse once. Between there and CP3 my left leg decided to cramp up hills. I had to keep stopping and wait to the side for up to a minute for it to subside. Then I’d continue, and it would happen again and again. Frustration! I thought if this keeps up I’ll be out here far too long, and if it gets worse – well I’m toast. A couple of kind people gave me salt tablets. I’d been taking electrolytes but just not enough of them at around 2 an hour. When I talked to Mal about it at CP3 (46km), he immediately said get them in at the rate of 1 every 15 mins. Downed a couple of mugs of coke – yum. I had quite a few cramps in the lead up to Nellies Glen but otherwise was fine between CP3 and 4. In fact I didn’t find the dreaded Nellie to be too bad at all. I cramped again just going up the steps into the Aquatic Centre at CP4 (57km) but was still in good shape otherwise. Things finally started coming right as I was going along the trails at the foot of the hill heading towards Leura. With no cramping I felt good and could at last just get on with it. Had a loo stop at the 66km aid station – it was a quick side trip across the park and back. Got my head torch on and ready since it was about 5pm and getting dark quickly. I also grabbed my high-vis vest and shoved it in a side pocket for easy access. I presumed we’d need that fairly soon too. Between CP4 and 5 there were a stack of ups and downs. Well into this section I was with a guy from Liverpool for a while (never got to see his face, but I recall he was wearing a Union Jack buff). We were chatting away and going comfortably up the stairs. We passed a woman with poles who was finding the uphill hard going and she remarked ‘how can you talk and do these stairs at the same time?’ I thought, actually yeah, wow I’m feeling strong. Getting into and out of CP5 before 7:30pm became a goal because leaving later than that would mean having to carry my fleece as part of the mandatory gear. It’s a bulky item, my pack was already pretty full and it wasn’t cold enough to need it anyway. I didn’t relish the idea of it tagging along as an unwanted passenger. Had a strong run up the sealed road and then down into CP5 (78km) arriving a bit before 7:20pm. Got a lot done with Mal’s help: changed my head torch battery, filled my bladder and bottle, got down some coke, picked up my Thir headband and my fingerless gloves, grabbed a banana and used the loo. I was out of CP5 with 4 or 5 mins to spare. OK so 22kms (about 4 hours) to go – but it felt like the home stretch! I knew now I was going to do it but kept a lid on the excitement. I reminded myself that anything was still possible – don’t get ahead of yourself. Keep concentrating: hydration, electrolytes (still every 15 mins), food (just nibbling and barely sucking at Pocket Fuels at this stage), is the body ok? Try to relax, don’t over compensate on anything….keep doing this checklist. Keep doing what you’ve been doing. It was a long, steep 8km run down a fire road to the bottom of the hill and the ford across the creek (with concrete block stepping stones – tricky on dodgy legs). Downhill really bothered the blister under the callous on my left foot (I’d noticed it very early on – before CP1 even – but it had been completely manageable). It felt like it had popped or something – this was after 13:15 of elapsed time – and I thought oh no I’ve still got maybe 4 hours left. I don’t really have anything suitable to fix it with, and I don’t want to stop anyway. I had come too far and could almost smell the finish line. I recalled my Oxfam blisters from a few years before, which although bad and very painful at first, were forgotten until the finish line. I determined that this blister would just have to do the same. Grabbed yet another banana at the final aid station (91km mark). I had enough water in my bladder to get me home, there was no point getting anything in the bottle to carry more than I needed up the hill (although it would’ve been nice to have been able to put a Fizz tablet in). It was all up hill to home from here. 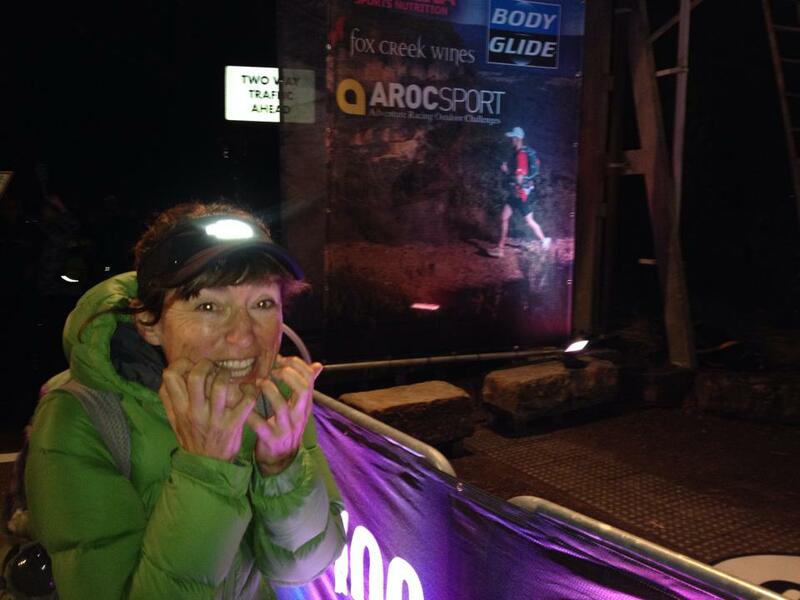 I crossed in an emotional daze to Mal telling me that I’d won my age group. I didn’t believe it. We stumbled up to the terrace (more stairs!) and collected a hard earned bronze belt buckle before going inside. We sat down and I started to feel slightly unwell. A doctor (the lovely Jacinta) cruised past and suggested I hang with them in the first aid corner. She helped me out of my cold sweaty clothes, into dry clothes topped off with my puffer jacket, beanie and puffer jacket hood. I got wrapped up in a couple of blankets as well then lay down on a cot where I was shaking with cold. Amazing how quick a bit of mild hypothermia can set in. All very normal responses for long distance runners apparently, so I didn’t feel too bad taking up space in the med tent. Jacinta said they’d had 12 people at once not long before and she was expecting several more before the night was done. I had warm water, tea, fries and some hot soup and was feeling much better before too long. By then it was official, I actually had won my age group. What an epic day. I’m still feeling overwhelmed by it all and am just a little bit in awe of what I’ve done. Way to go legs!! And stomach. And head. And finally, thank you to Mal for supporting me all the way from the hospital bed to the finish line of this life affirming run. 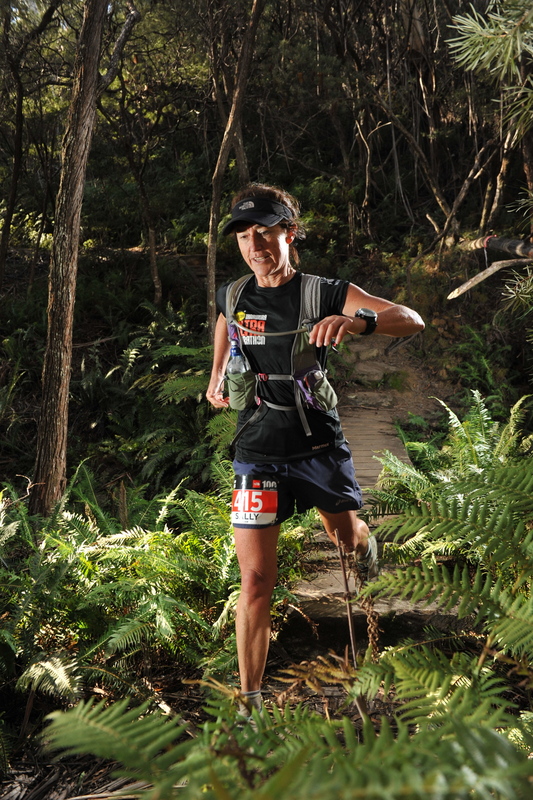 TNF100 Australia is outstanding. 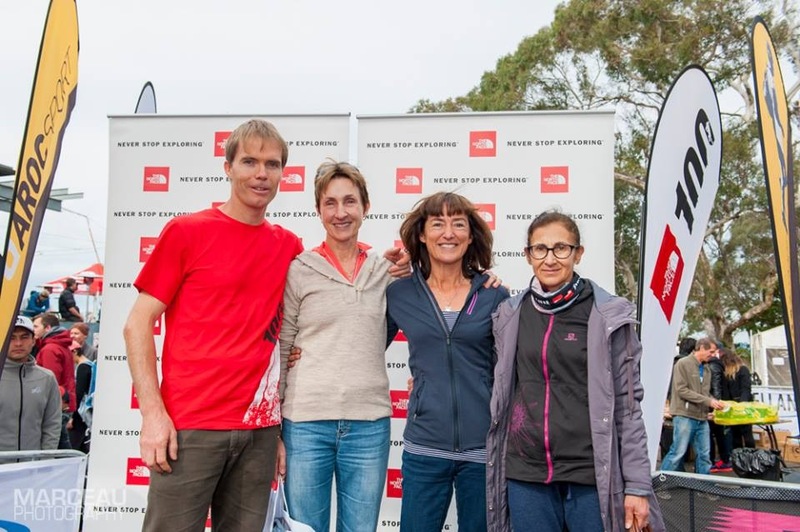 Race organisers, Tom and Alina, do a superb job in ensuring this huge event (1,000 competitors in each of the 100km and 50km distances) retains the atmosphere and heart of a much smaller affair. Grateful thanks to everyone involved, especially the wonderful volunteers – all of whom were friendly, helpful and supportive. No wonder people keep coming back again and again to test themselves on this beautiful and brutal course. Food: 6 bananas, ½ a PBJ sandwich, 1 x small One Square Meal bar, small amounts of Pocket Fuel (about ½ of one in total), 3 jet planes, 2 small pieces of watermelon, ¾ of a Cliff Bar, about 4 lollies. 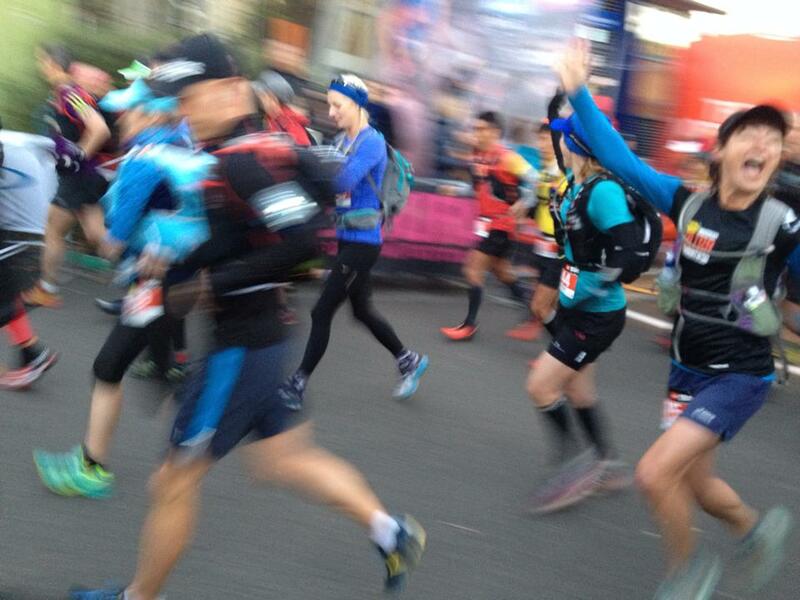 Fluid: Bladder refilled 3 times (CP2, 4 & 5), bottle (400ml) refills CP1, 2, 3, 4, at 66km water station & again at CP5. Also had about 3 mugs of coke plus a few swigs of electrolytes when I saw Mal at CP3,4 & 5. In my bottle I had either diluted coconut water or water with a Hammer Fizz electrolyte tablet. Had a lot of Hammer electrolyte capsules: a couple an hour for 6 hours, then 4 an hour for 10 hours. 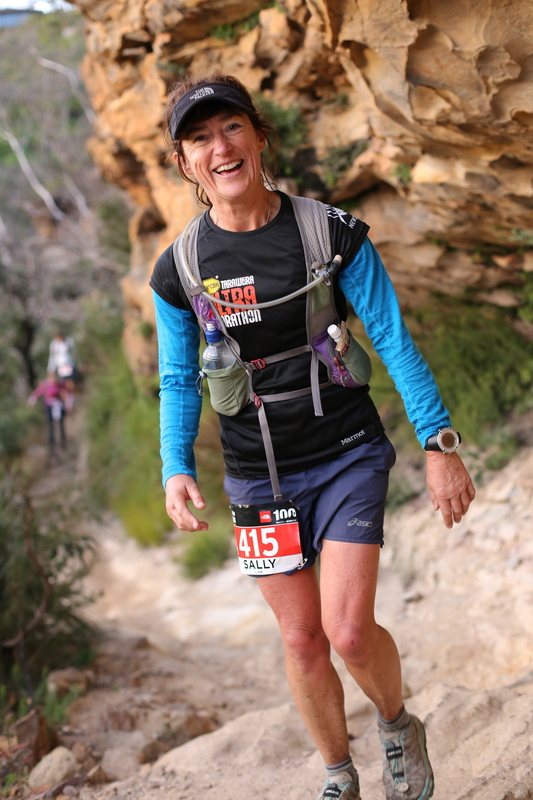 This entry was posted in Ultra racing, Uncategorized and tagged Sally Law, TNF100, ultra running. Bookmark the permalink. Epic effort Sally! I remember following Mal’s updates of your progress intently. Congratulations girl! You’re quite an inspiration! Good read Sal. What next? The miler at Naseby.You will Blitz it. I’m so proud of you, Sal! You’re an inspiration! You’re recount of the event was a great read. Congratulations! WOW! Very well written, so real, comes closest to giving a 2-time marathoner an idea of what an ultra feels like. Thank you for sharing, and well done! Nice write up Sal, legendary run !